Soup! Another soup recipe! 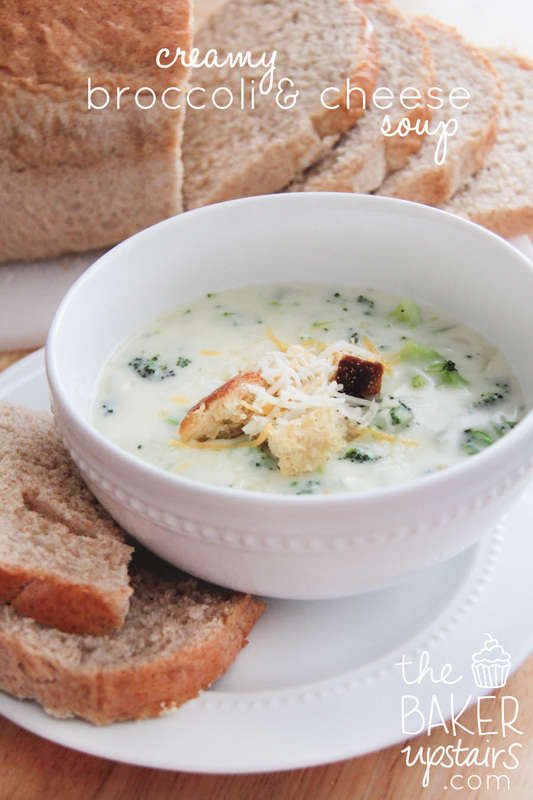 I already have a great cream of broccoli soup on the blog here, but I love broccoli (and cheese!) so I'm always up for trying a new recipe. And this recipe is the bomb! It's the only broccoli soup I've made that maintains its texture perfectly after freezing. I love that it's still creamy and cheesy and delicious, even after a month in the freezer. This is one of my very favorite things to keep in the freezer for an easy dinner! I usually just ladle it into pint or quart sized reusable containers (I like the Ziploc Twist n' Loc ones so I know they're actually closed) and let the soup cool in the fridge overnight, then freeze the next day. When we're ready to eat, I thaw it just a little in the microwave on the defrost setting, and then heat it the rest of the way on the stove. If I was better at planning ahead, I would just thaw it in the fridge overnight, since that's by far the easiest way. Fresh or from the freezer, this soup is awesome! Simmer chicken broth and chopped onion for 15-20 minutes in a covered small saucepan, until onions are soft. Heat milk in microwave for 1-2 minutes. In a separate medium-sized stockpot, melt butter then add flour, salt and pepper. Cook together, stirring constantly, for 2 minutes, then whisk in warmed milk. Stir and heat together on medium heat until soup starts to thicken, about 5-8 minutes. Add warmed chicken broth and continue to stir until well blended. Add cheese and stir until completely melted. Stir in steamed broccoli. Add more salt and pepper to taste, if needed. Serve immediately in bowls or bread bowls. I love how simple this recipe is. And much lighter than the one I make with heavy cream and American cheese.